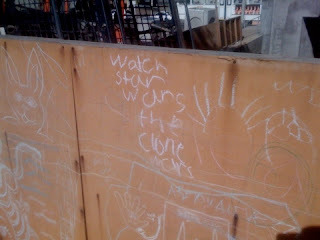 CC from Portland, ME sent me this link to some chalk graffiti on the plywood surrounding some playground construction. BAD Children! Keep it up and you will be drawing very inappropriate things, rather than marketing for George Lucas in less than a decade!